And Yes, YES, I am aware that there are “finished” open source components out there that provide similar functionality. I like to tinker with these things because I am learning a hell of a lot about how to make great components. In short: for the fun of it. ADDED: [DTAlertView] Method to create a cancel button and/or set a cancelBlock. The idea is that I want to have an NSObject represent the database and then have a simple method to query it. The results are automatically repackaged for you into an NSDictionary for each row. Note that in SQLite all column names turn to lowercase. At this moment this supports the SQLite types TEXT, INTEGER and FLOAT. If you need more let me know, those are easy to add. If you are the only person making calls to fetchRowsForQuery:error: and you don’t care that this is executed on the current (main) thread, then that’s all it takes. DTSQLiteDatabase has a features that famous FMDB does not have, but which I needed. Imagine you starting a query that might take a while in the background, but while it is underway the user decides that he doesn’t want to wait. You can interrupt long-running queries via the cancelAllQueries method. I only implemented the absolutely necessary parts, but this works very nicely so far for my use case. The documentation can be found on our docs server. There is a long list of apps that use said UI paradigm. The idea is that you are not waisting screen real estate by having tabs at the bottom of your screen like you would with a UITabBarController. Or a big viewController tree under a UINavigationController. For a short while I considered calling this DTHamburgerMenuController, for the fun of it. 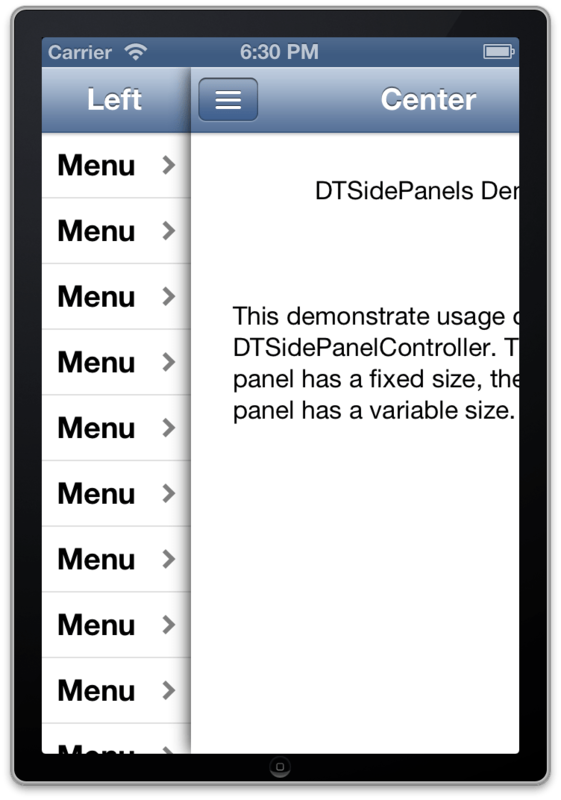 But eventually I decided on DTSidePanelController instead, sounds more professional. Support fixed or variable sized side panels. A fixed panel always keeps its width on rotation. A variable-width panel resizes such that you always have sufficient place to tap the center panel for closing. Rotation support, panel view controllers are queried for supported orientations, compatibly with iOS 5 and above. Appearance notifications for the view controllers and views fully implemented. viewWillAppear fires as soon as the panel becomes visible. There are a few things that I decided against doing for the first version. For instance some implementations have a rubberbanding effect following the animation. The problem with this approach is that to support that you would have to under-lap the panels under the center panel so that you don’t see the background when it overshoots the limit. It is probably for this reason that most professionally made apps don’t have that. YouTube does rubberband, Facebook doesn’t. The demo also shows how to lock a panel. If you go to the right panel you get a switch to prevent closing of the panel. You are welcome to give my components a try, even if they are not as popular as FMDB or the various other implementations of the “hamburger menu”. I am interested to receive your comments or feedback.